The trees below are necessarily devoid of every single family member, which would take complete rolls of wallpaper to reproduce. I have only included individuals and families that I have written about. If anyone should wish to have further, more detailed trees please comment below and I will do my best to help. The family of my maternal grandfather: Reginald Frank RIDOUT…. The family of my maternal grandmother: Elsie May BEATON…. 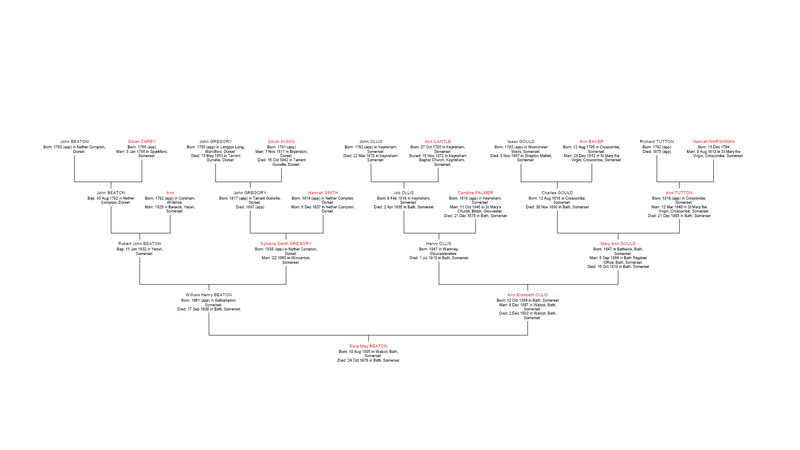 The descendants of Thomas ORCHARD of Widcombe. My ARCHARD family and the peruke makers of Abbey Green descend from Thomas ORCHARD and Elizabeth BRIGHT. The non-conformist ORCHARDS descend from Thomas ORCHARD’s brother Joseph and his wife Ann, who lived in Monkton Combe near Bath…. Martha SOMERTON (my x3 great-grandmother)’s Bristol family, proprietors and publishers of the Bristol Mercury over four generations…. Amazing ! I found your wonderful family history while researching my own. Edwin Ridout(1833) is the father-in -law of my great aunt, Eliza Louisa Jefferies. Glad you like the blog, thank you. Let’s correspond off this site. I will write to you privately in a jiffy. Hi, just found your site – what a lot of information! 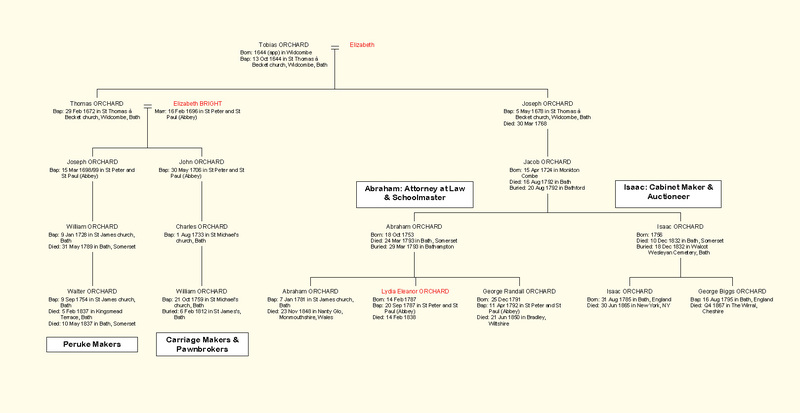 My ggggg grandparents were Abraham Orchard (1753-93) and Martha Bishop (1757-95). I have copies of family papers for them (athough who knows where the originals went that we used to have!). Thanks for your message – I guess you might find out quite a bit about your family here, including some things you didn’t know hopefully 🙂 I spent quite a lot of time researching my ARCHARD family and they quickly turned into ORCHARDS before I was too far back in time. Abraham and Isaac were the most interesting men I think; they lived in a world where was so much was happening and they seemed to have been in the thick of it. I enjoyed finding out and writing about them but my own family were a rather more modest bunch, as is always the way. It is a shame that you don’t have your original family papers any more; I guess that’s often true – I don’t either. As a relative from across the pond I found you wonderful post and am overjoyed! Your work together with that of Arthur George pvovides the documentation I have searched for years to find. The detail provided is more than I ever hoped to find. The difficulty mentioned regarding the loss of documents due to the WW II air raids echos across time as many records here were lost to the American Civil War 1861-1865. The brunt of the Civil War occured where Giles (the sailor) relocated as well as the next four generations in the Virginia counties of Dinwiddie, Brunswick, Sussex and Petersburg. I am writing in hopes you have the time to correspond. Admittedly, I am having dificulty not only with five Giles but also trying to construct a direct lineage. 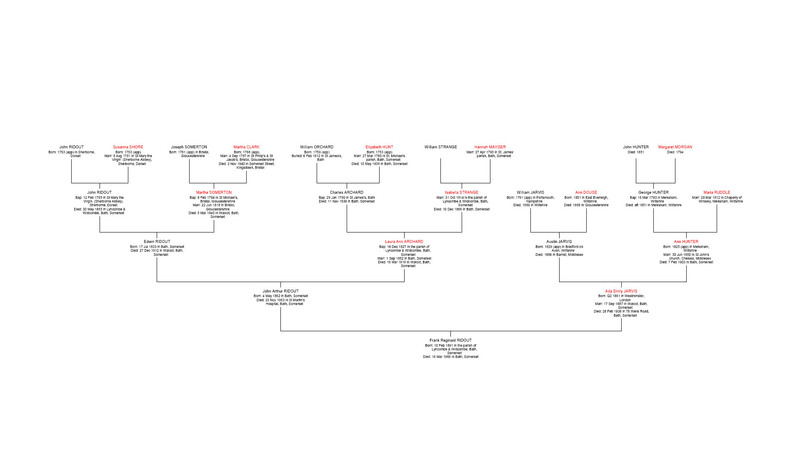 Have you seen or located a family tree for the Ridout family prior to the 1699 Giles? Thank you for your lovely comment; I’m glad that you found oje of my posts useful to you 🙂 I’ll have a root around all my paperwork and see if I can help you… I will gladly correspond with you and will do so via email; it’s close to the Christmas holiday, of course, so it may be a few days! i so wish i could find a small trace from my mother’s side. Unfortunately she died on the 22nd september. She always wanted to find her family. 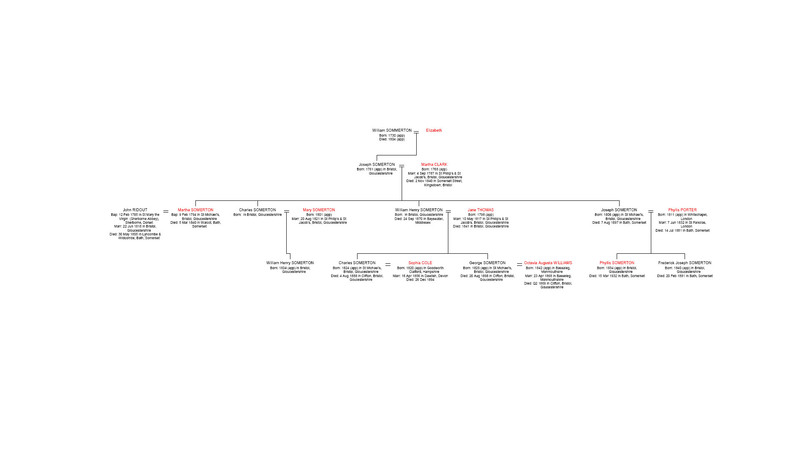 Karen – using an unsourced tree on Ancestry (yes I know I shouldn’t do this!) it appears that my RIDOUTs and yours could be connected at Thomas (b 1574, m Edith PALMER, by the looks of it his second wife – you are descended from his first, Edith OLDISH). My male RIDOUT line, which is very largely from Okeford Fitzpaine, stops at John (1848-1927, m Jemima ROSE), I descend from their daughter Temperance. Pity, as it would be interesting to join the yDNA project. I’m in the process of “mending” my website so if you look you may not get to the data. Anyway… not wishing at all to throw cold water on your hopes, you say that your family may descend from Thomas and Edith Palmer (who certainly had a load of children!). Can you tell me from which son? I will look at my notes and see if I can help you. It is a shame, I agree, that you have no male Ridouts; a yDNA test would have been very helpful in indicating if you were on the right path. Thanks for dropping by; I’d love to hear from you again. We may be able to work out your OF ancestry? hi,i believe an Elizabeth Ridout was my 4th Gt Grandmother,was married to Henry Horsey in 1802 at Bath St James,is there a connection?.. Hope you are keeping well. I’ve just started looking into my family history since my mothers passing last year, and tonight I came across you’re web-page. Really interesting! FYI my mothers, father was Clarence Harold Ridout, his father was, Frank Percy Ridout, and his father was Edwin Ridout B: 17.07.1833. I’m part of the Butler line as my mother married William Edward Butler B: 04th May 1923. Most of my senior generation has now passed. Thank you for your reply. Mum was indeed Margaret P Ridout and Nan (Gertrude), wife of Clarence Harold. Both Mum and Nan died from dementure at good ages as you can see! Any info on Clarence and other family members would be great as no records have been passed down due to a house fire, many years ago. What a rich and detailed blog! I have enjoyed visiting. I have a small thing to share with you – a tiny envelope sent to H.L Orchard, Esq, Clare College in 1868, which I picked up at a stamp fair in Cambridge. Whilst there is no letter in the envelope, there is a message written in the envelope, pleading with HLO (Henry Langhorne Orchard 1843-1921) to get in touch, but no sender’s name. Postmark is Uttoxeter. Do contact me if you’re interested at all or would like a scan for your blog. I would say that it’s possible that your chap, Frederick James Ridout was bp. in Holnest on the 2nd February 1824 and was the son of John Ridout (1791-1858) and his wife Ann (nee BRADLEY; ~1810-1864). John was a gamekeeper; in the 1841 census the family were living in Puddletown in Dorset. Another Ridout descendant here, I am a 3rd cousin to Orlando Ridout in Annapolis. So I think we are related to you, according to your blog. I just found you online because I was looking up John Ridout the 1st, who married Mary Ogle. They are my 4th Great grandparents, and as I am 64 now, I think we are the same age and same amount of generations down the line. Nothing to add, other than that I live near Washington, D.C., but we also have a tiny house in Dorset. What a nice surprise; thanks for dropping by! I met Orlando (Lanny) when he came over in 2004 but we don’t correspond any more, as you might imagine. Yes, you and I definitely are related but, off the top of my head, I don’t know the exact relationship. Where my Ridout branch joins the larger tree has been the main focus of my research over the years, hence this blog, book, yDNA study etc. Always a quest! You’re right about ages – I’m 66. We are both on Facebook (you were easy to find) and we evidently both love Dorset. I grew up, for a while, in Weymouth but had no idea at all then of my deep Dorset roots. Now I go occasionally to have a few days in Dorchester or Sherborne and I love it. Unfortunately I live in Wales so don’t get down there too often. Where is your ‘little house’? I’d love to hear more…. I’ve been away on holiday and just got back. Our house in Dorset is in Cerne Abbas. My Ridout ancestor came from Sherborne. John Ridout the 1st, born in Sherborne in 1732. Died in Annapolis. I haven’t seen Orlando in many years, although I ran into his daughter at a special gathering at Whitehall in Annapolis about 4 years ago.